Werner Herzog is one of the world’s greatest living filmmakers. Most of his narrative films and documentaries depict humans struggling in unimaginably chaotic and unpredictable circumstances. Here’s a selection of Herzog classics. Aguirre marked the first in a series of five collaborations between Herzog and his notoriously difficult star Klaus Kinski. The plot concerns a group of conquistadors heading down the Amazon in search of El Dorado, the fabled lost city of gold. The expedition descends into chaos and madness, with Kinski’s towering performance being the main driving force behind the film. An instant classic held in great reverence by critics, Aguirre was one of the main influences behind Francis Ford Coppola’s Apocalypse Now in its exploration of the limits of human sanity along a seemingly endless river. This film follows the true story of a young man in 19th century Germany who claimed to have lived his entire early life in the complete isolation of a cell, and features the remarkable Bruno Schleinstein as the titular character. Schleinstein, who was credited as “Bruno S.”, was a self-taught street musician with a history of mental illness who was sought out by Herzog. Though he had no training as an actor, his performance is breathtaking. Written specifically for Schleinstein, this is a tale of the American dream gone awry for a group of German immigrants who had sought a better life across the Atlantic. Stroszek is a downbeat, melancholic feature highlighting human misery with some elements of dark humor. The film was shot in an almost documentary style and features very little stylization, which adds to the realism and empathy you feel for the hapless protagonist who finds no happiness or fulfillment in rural Wisconsin. Herzog’s Nosferatu, starring Klaus Kinski as the vampire and Bruno Ganz as the unfortunate soul who becomes trapped in his castle, is a worthy successor to F.W. Murnau’s 1922 masterpiece. The gorgeous colors and spellbinding cinematography of Herzog’s version make it more accessible to modern audiences than the silent film. It is arguably the most beautiful version of Bram Stoker’s Dracula story, and, at the very least, significantly less silly than the 1992 Coppola adaptation. Herzog and Kinski returned to the jungles of South America to make this extraordinary film about one man’s perseverance in the face of seemingly insurmountable odds. The film is best known for the astonishing sequence in which a steamship is transported over a hill by an army of indigenous tribesmen. Tensions between Kinski, Herzog, and the rest of the cast and crew ran predictably high. The story of the film’s fraught production is told in Les Blank’s great documentary Burden of Dreams. Based on The Viceroy of Ouidah, Bruce Chatwin’s novel about the life of a fictional slave trader, Cobra Verde was the final collaboration between Herzog and Kinski. The tensions behind the camera reached their apex during production, prompting the cinematographer to leave the project rather than subject himself to any more of Kinski’s tirades. Despite this, the finished product is a hugely entertaining tale of action and adventure in which Kinski leads an army of female African warriors in open rebellion. That’s definitely not something you see every day. This quasi-documentary, featuring very little context or commentary, takes us on a tour of a desolate landscape recovering from a major conflict. The conflict in question was the First Gulf War (1990-91), though there is no mention of this in the film. 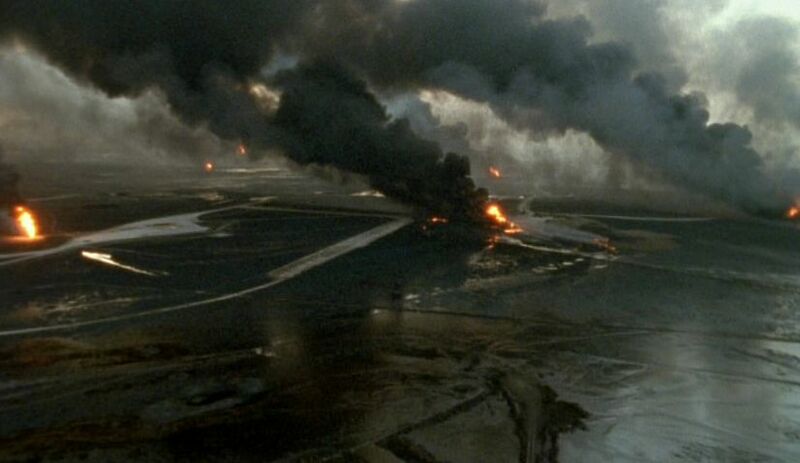 The consequences of the Iraqi defeat can be seen in the scorched oil wells of Kuwait which dominate this beguiling record of human destruction. Herzog had taken a similar approach in his earlier Fata Morgana, but here we see his vision more fully developed in both scale and scope. Dieter Dengler was a German immigrant to the US who ended up flying combat missions during the Vietnam War. He was shot down in 1966 and subsequently imprisoned and tortured by the Vietcong. He managed to stage a daring escape, and would eventually become the subject of this gripping and moving documentary. Dengler and Herzog share a common German background, and the two formed a strong bond over the course of the film as they recreated the past events. Herzog then turned them into his 2007 war drama Rescue Dawn. The fascinating life and gruesome death of American bear enthusiast and committed environmentalist Timothy Treadwell are explored in what would become Herzog’s most commercially successful and critically acclaimed documentary. Treadwell spent 13 summers living with wild bears in Alaska’s Katmai National Park and Reserve before being dismembered and eaten by bears, along with his girlfriend. Herzog combines Treadwell’s own footage with interviews of the people who knew him intimately in an attempt to understand what motivated the man. One of the most tragic and unique nature documentaries ever made. Nicolas Cage is a superb actor who has made a number of exceptionally poor career choices, but thankfully his collaboration with Herzog was not one of them. This remake of the Abel Ferrara cult hit, which starred Harvey Keitel, has become something of a classic in its own right. The film plays to all of Cage’s strengths he takes on the role of a New Orleans police sergeant who descends into a drug haze while he investigates the murders of Senegalese immigrants.